Perfect filtering to the extent of 1µm chips or shavings in grinding fluids or cutting oils. The filtered coolant can insure the sub-micron grinding operation. - Diatomaceous earth as filter aid promotes the filtering of micron sized chips or shavings. - Easy cleaning of filter medium. 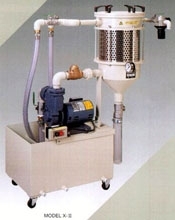 - Micro X Filter can be easily incorporated into the coolant tank of a grinding machine.